The stunning spectrum of pinks in this statuesque creation contrast beautifully against orange and peach blossoms. 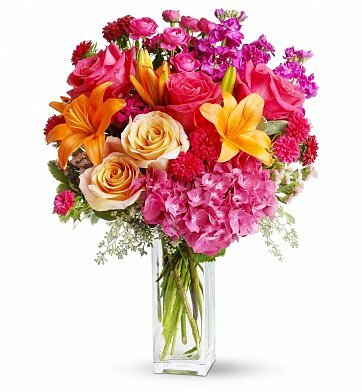 Delivered in a contemporary vase, it's a bouquet that's sure to warm the hearts of all. Hot Pink Roses (40 cm). Dark Pink Sweet William, Seeded Eucalyptus and more. Standard Arrangement Measures 15" x 21". Joy Forever is a hand delivered gift. These gifts are delivered by one of our local design centers located throughout the United States and Canada. Same day delivery is available for most gifts when ordered before the cutoff time. The cutoff time for Joy Forever is 12 PM in the recipient's time zone. My mom said that the flowers we sent her were the most beautiful flowers that she had ever gotten! Thank you!